The ActFast Anti Choking Trainer is worn by students in CPR class to learn the Abdominal Thrust Maneuver (Heimlich). When performed correctly, a foam plug shoots into the air, making instruction realistic and leaving students confident. This is the top range version with back slap plate as well. For years, instructors have struggled to show students "how it may be performed in reality, only harder." The Actfast Anti Choking Trainer offers a realistic way to teach students how to perform abdominal thrusts (the Heimlich Manoeuvre) correctly and safely. 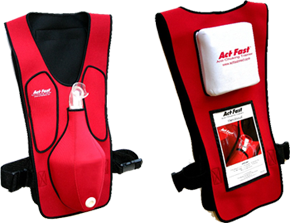 Unlike CPR Manikins, there are no replaceable parts in the ActFast Anti Choking Trainer making it extremely cost effective.